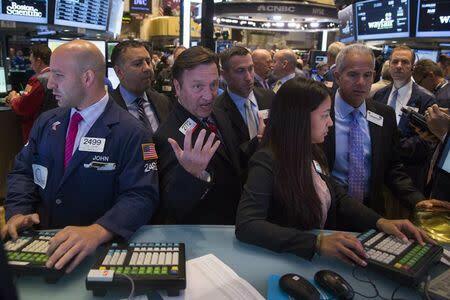 NEW YORK (Reuters) - Stocks worldwide were lower on Thursday after European Central Bank President Mario Draghi failed to provide nervous markets with a specific stimulus program for the euro zone's shaky recovery, while U.S. markets steadied after a recent sell-off. Although Draghi reiterated that the ECB remained ready to use further unconventional policy tools if needed, a lack of specifics on the bank's plan to buy secured debt left investors unimpressed. Losses in Europe were steep, with the FTSEurofirst 300 index <.FTEU3> falling 2.4 percent. But on Wall Street, the S&P 500 <.SPX> managed to barely halt a three-session losing skid, ending the session flat after falling to its lowest level since Aug. 8. "People don’t need to panic, so you traded below your 50-day moving average - you are still far above your 200-day moving average," said Keith Bliss, senior vice-president at Cuttone & Co in New York. "So you are seeing buyers just finally saying 'it is time to step in.'" Draghi repeated that the ECB hopes its recently announced plans will add a trillion euros to its balance sheet. But poor demand for a new round of cheap loans last month is raising the pressure for it to be more aggressive. The Dow Jones industrial average <.DJI> fell 3.66 points, or 0.02 percent, to 16,801.05, the S&P 500 <.SPX> gained 0.01 points, or flat, to 1,946.17 and the Nasdaq Composite <.IXIC> added 8.11 points, or 0.18 percent, to 4,430.20. The euro rose 0.3 percent, its biggest gain against the dollar in two weeks. "The euro rose not because of what Draghi said, but what he didn't say," said Omer Esiner, chief market analyst at Commonwealth Foreign Exchange in Washington. "We haven't heard any meaningful language regarding an increase in the scope of assets to be purchased, in other words, outright quantitative easing." Investors have become more cautious recently as they digest economic data and other news. Data on Wednesday showed that German factory activity shrank for the first time in 15 months and China's manufacturing sector is barely growing. The first diagnosed case of Ebola in the United States added to the skittish investment climate. MSCI's 45-country world stock index <.MIWD00000PUS> fell 0.6 percent to give the index its first four-day skid in two months, but did cut declines after it hit a five-month low of 407.18. Oil prices remained under pressure after price cuts from top producer Saudi Arabia added to a supply glut. Brent crude oil settled down 0.8 percent at $93.42 after earlier hitting a low of $91.55. U.S. crude settled up 0.3 percent at $91.01 after it earlier fell as low as $88.18, its lowest level in almost 18 months. Markets are also grappling with the imminent end to the Federal Reserve's massive monthly bond-buying program, which is raising questions about the timing of the Fed's first interest rate hike in years. The risk-averse global mood pushed 10-year U.S. Treasury yields - the benchmark for world debt markets - to as low as 2.38 percent on Wednesday. But on Thursday the 10-year pared losses and was last down 10/32 in price to yield 2.4357 percent.